Karl Marx’s writings have exerted a substantial influence on politics and on the way that philosophers have engaged in public matters since the nineteenth century. 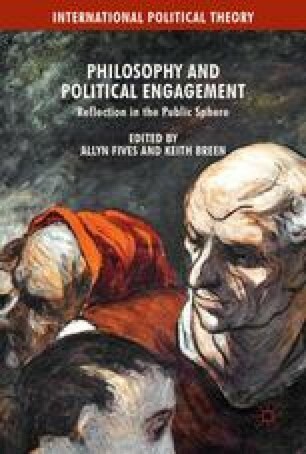 In this chapter, Wood makes a plea, on grounds of intellectual honesty and for the sake of the long-term interests of humanity, to read Marx’s writings for what they say, rather than interpreting them in the light of deeds done by others in their name over a generation after Marx’s death. Wood notes that Marx, in fact, wrote almost exclusively about capitalism, saying very little about the socialist or communist society he hoped would eventually replace it. In addition, capitalism is still with us, and Marx’s thoughts about it have more relevance to current social reality than we have any right to expect from writings that are 150 years old. Inequality.org—Institute for Policy Studies. (2012). Facts and figures in 99 to 1. http://inequality.org/99to1/facts-figures/. Accessed 20 July 2015. McIntyre, R., Gardner, M., & Philips, R. (2014). The sorry state of corporate taxes: What fortune 500 firms pay (or don’t pay) in the USA and what they pay abroad—2008 to 2012, citizens for tax justice. http://www.ctj.org/corporatetaxdodgers/sorrystateofcorptaxes.php. Accessed 20 July 2015.